Regardless of whether you call it debt saturation or diminishing return on new debt, the notion that taking on more debt will magically enable us to “grow our way out of debt” is not supported by data. The purpose of this chart is to examine the relationship of total debt to GDP. Since Debt is not factored into GDP, just exactly how much debt is being used to create growth, and over what time periods. But absolute numbers don’t work so well, since they don’t let you examine particular years, seeing what the 1950s look like vs the 2000s, for example. 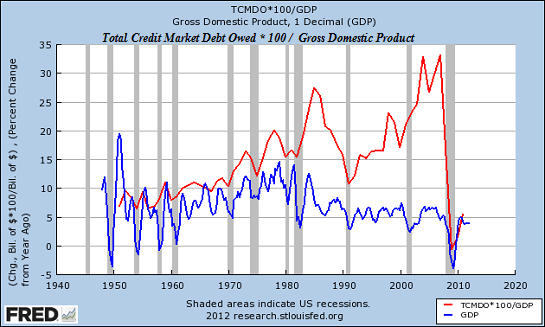 Red Line: Annual Change in TCMDO (Total Credit Market Debt Owed) * 100/ That year’s total GDP, showing that year’s % increase in TCMDO/GDP. Any gap between the red line and the blue line is what I would call the creation of debt in excess of income. And that gap is the ANNUAL gap, not a cumulative gap. As an example, in 2008 TCMDO grew by an average of 30% of that year’s GDP, while GDP itself grew by around 5%. Ouch. The following is a report issued today on the economy by Curtis-Rosenthal, Inc., a well-respected real estate appraisal and consulting firm in Los Angeles. This week our friends at Wells Fargo Securities (WFS) caution that storm clouds are brewing on the economic horizon. After some tough economic data reports, the Fed downgraded their economic outlook. We also have to watch out for the “fiscal cliff” that looms ahead of us in 2012. Read on for more specifics….